Personnage - Scoundrel - Scavenger. Points: 9/12. Santé: 9. 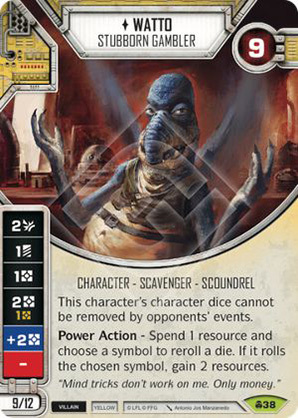 This character's character dice cannot be removed by opponents' events. Power Action - Spend 1 resource and choose a symbol to reroll a die. If it rolls the chosen symbol, gain 2 resources. "Mind tricks don't work on me. Only money."